On March 11, 2011, Japan suffered the Great East Japan Earthquake of magnitude 9.0. It was the most powerful known earthquake to have hit Japan in recorded history. It also produced a massive tsunami wave that hit the coastal area of Japan. The earthquake and the tsunami left extensive damages to Japanese oil industry as well as to the nuclear power plants, and made us re-acknowledge the importance of plant reliability against natural calamities. Back in 2003, Idemitsu's Hokkaido Refinery experienced an earthquake named the Tokachi-oki Earthquake that induced tank roof sloshings and a full-surface fire in a naphtha tank. As a result of the failure analysis for tank damages, some modifications such as lowering tank storage level and reinforcing floating roofs have been applied to tanks. The experience of this catastrophic event also triggered the necessity of further assessments on comprehensive plant reliability to withstand natural calamities. 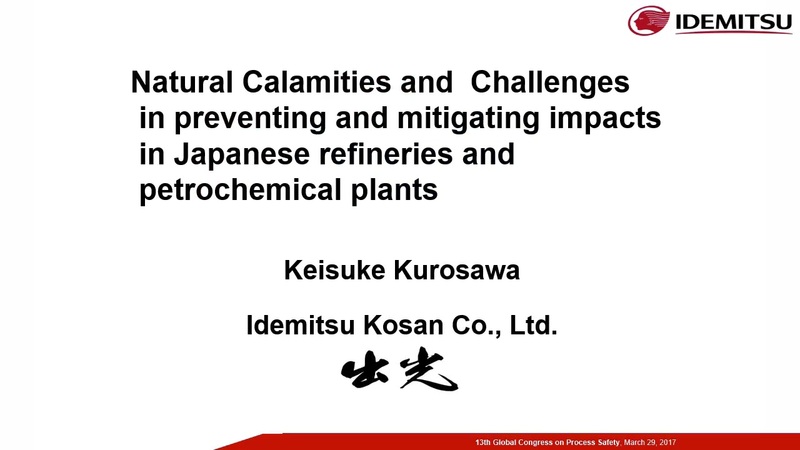 This presentation shares our past experiences and current practices focusing on a plant reliability against natural calamities such as Earthquake ,Tsunami, etc..